A Brampton jury ordered Dr. Erez Tamari of Mississauga, Ontario to pay $1.3 million in a medical malpractice trial on January 17, 2012. Eight-year-old, Jane Armstrong was the recipient of the $1.3 million for an injury sustained during her birth on October 8, 2003. Left with a permanent birth injury to her brachial plexus, Jane’s left arm and hand are limp. After going through a normal pregnancy, Jane’s mother, Karen Armstrong was diagnosed with shoulder dystocia, a condition that occurs during labour and delivery when a baby’s shoulder becomes lodged behind the mother’s pubic bone during its descent through the birth canal. In the case of Jane, Dr. Tamari attempted to dislodge Jane’s head by pulling her head to try to deliver the baby’s body after her head had emerged. It is believed that this pulling of Jane’s head is the cause of her injury. Composed of a group of nerves that run from the neck to the C5 and T1 vertebrae, the brachial plexus is what enervates the hands, wrists, elbows, arms, and shoulders. It was determined at trial that when Dr. Tamari pulled on Jane’s head to dislodge her from her mother’s body, he caused her brachial plexus to tear and it ruptured resulting in irreparable and permanent damage to Jane’s left arm. 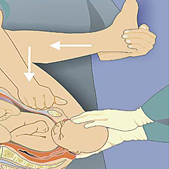 While a delivery that requires fetal maneuvering to extract the baby may be uncomfortable or cause perineal and vaginal lacerations to the mother, the risk to trauma to the baby is far more complicated. Complications that can develop as the result of shoulder dystocia for the baby include death, brain damage, brachial plexus (Erb’s) palsy, fractured clavicle, and other injuries. Birth injuries are tough on parents and children alike, causing a joyful event to become a nightmare. Families who must deal with a child suffering from a birth injury will need lots of emotional, physical, and financial support. While a medical malpractice lawyer can’t offer parents a miracle recovery, they can lend support and assistance to parents who think that medical malpractice was the cause of their child’s disabling condition. Girones Lawyers are experienced in assisting those wishing to file a medical malpractice lawsuit to gain some compensation for the damages they have sustained and to put doctors and hospitals on notice that sub-standard care will not be tolerated. If you, your child, or a loved one has been damaged by the negligence of a healthcare provider and need legal assistance, we are here to help. Offering free initial consultations, Girones Lawyers will evaluate your case to see if you have grounds to file a medical malpractice lawsuit.